Take your backyard design to the next level with custom hardscaping that shows off your unique style! Whether you'd like to entertain outdoors or create a peaceful oasis for relaxation and renewal, you'll love the beauty and value that quality hardscaping can bring to your outdoor space. 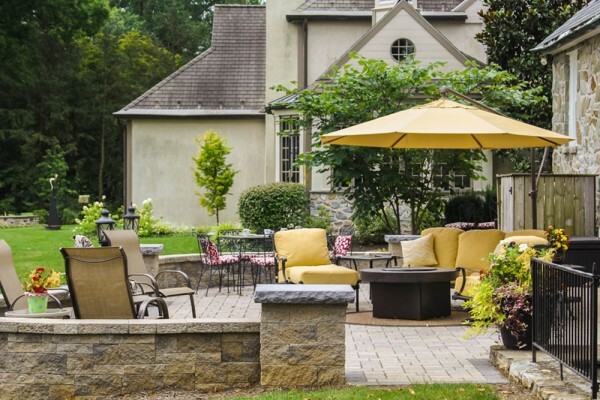 Since 2005, we've been helping homeowners throughout Berks, Chester, Lancaster and Delaware counties and beyond enjoy the outdoors more throughout every season with high-quality hardscaping installed by our certified installers. Put our knowledge and experience to work for you for beautiful results you'll enjoy for many years to come. Contact us today to get started! Remember the times you wished for a backyard space that you could enjoy more months of the year? That space with a custom fire pit, a fireplace and maybe a fan to keep you cool in the hottest months of they year? A carefully designed patio can be a space where you and your loved ones can gather night after night and create lifetime memories around the dancing flicker of the fireplace flames. Willow Gates Landscaping is more than Hardscape Contractor in PA, we love creating unique hardscape spaces that foster relationships with the most important people in your life. Turn your backyard into an eye-catching Place to Host your guests or enjoy with your family. Our Backyard Hardscape Installers will design and Install a patio to match your needs and transform your property into a conversation piece. We Install Hardscape of many styles, shapes and tones that will compliment your property and can design a patio with a pergola to create an inviting space in the backyard. Request a FREE Consultation to get started with your Dream Backyard space. There's something about the crackle of burning logs on a cool Spring or Fall evening that builds memories and strengthens relationships. Add to that the evening sound of katydids and the laughter of friends and your backyard will be the place where you, and those close to you will want to gather night after night. 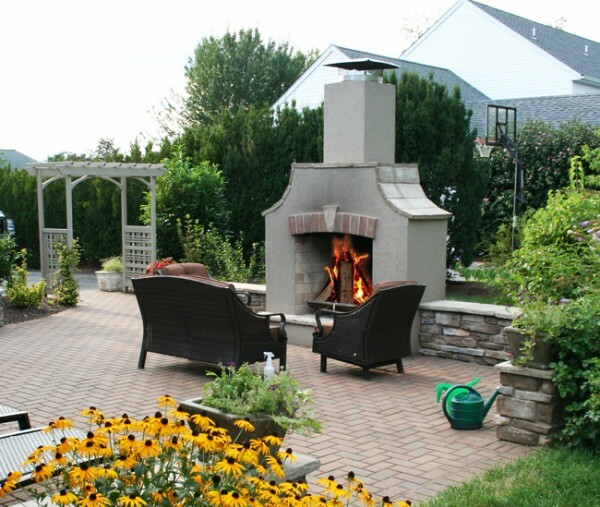 Willow Gates Landscaping will work with you to design and build a patio with a fireplace where memories can be made that will last a lifetime. We begin by taking your ideas and help you create a design that you can be satisfied with for decades. And did you know that adding a new patio to your backyard increases the value of your home? Combine your swimming pool with a well designed paver patio and gain space for lounge chairs, dining tables, and perhaps a built-in grill to serve your guests this summer. 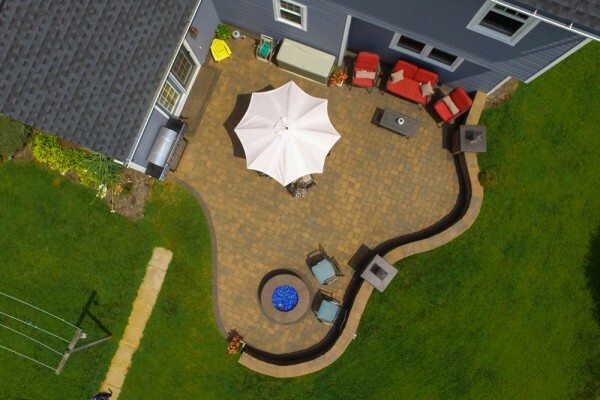 Permeable pavers can also be used for a poolside patio, which may provide much needed stormwater credits and improve drainage issues in your back yard. Swimming pool patios do present some concerns with structural stability; we have the installation experience and training required to ensure your investment lasts for many years. 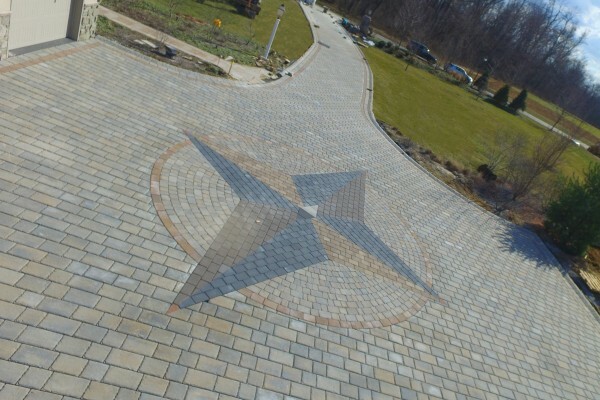 Imagine puling up to your driveway with its own unique style, utilizing interlocking concrete pavers. Willow Gates Landscaping also installs paver driveways, achieving distinctive designs with creative inlays and designs. By using permeable pavers, a paver driveway can become part of a stormwater management plan and gain credits to be used elsewhere. Our certified paver installers have years of hardscaping experience and many successful hardscape projects. Get started with a free consultation today. 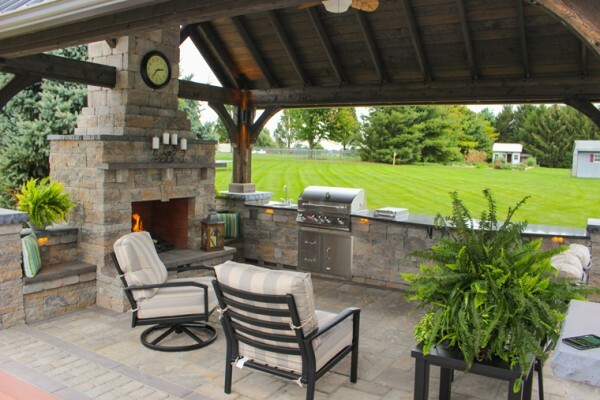 Not every hardscaping budget can afford this, but if you want to created a very useful space in the backyard, incorporate a patio design with an outdoor kitchen. 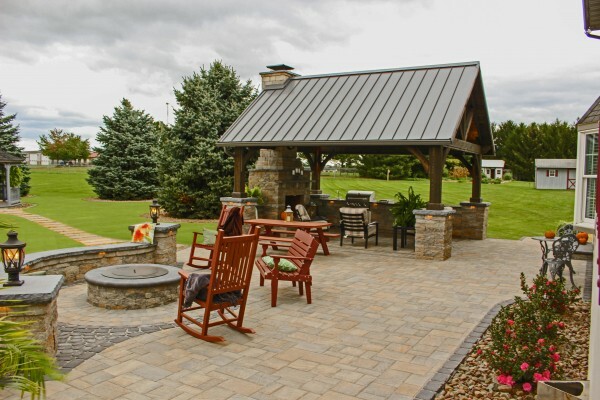 With a pavilion for cover, a fireplace for warmth and a ceiling fan for warm days, you'll be able to enjoy your outdoor kitchen many days out of the year. See our 7 Design tips for an Outdoor Kitchen and get in touch to begin designing your own space.